DPx Gear has been at it for a while now. They caught everyone’s attention with the original HEST fixed blade knife in 2008. Their first folder was the HEST/F, a knife I reviewed back in 2012. It was promising in a lot of ways, but ultimately a sticky lock and ponderous footprint kept it from being a truly covetable piece of urban EDC gear in my book. Since then we’ve reviewed a couple other DPx Gear folders, including the elegant Aculus and the cherry bomb proportioned HEAT/F. Both were beautifully made Italian knives. The HEST/F Urban is different from the other folders in that it is their first folder 100% made in the USA. Some may remember that DPx ran a Kickstarter campaign for this knife back in 2015. The Kickstarter campaign was a success, and the knife has since made it’s way into production. Robert Young Pelton himself reached out to ask if I would review a HEST/F Urban, and this knife was provided to me by DPx Gear for review. All thoughts on this knife are my own. The Urban has an overall length of 6.75″, a 2.875″ blade, and weighs 4.27 ounces. The knife is made in the USA. As the name suggests, this is a smaller folder designed for urban or suburban Every Day Carry (EDC). DPx Gear has made some big and interesting stuff over the years, including their HEFT 12 Chopper, so to see them move towards a true urban daily carry knife is interesting. The HEST/F Urban features the same signature blade profile of their entire HEST series. It’s a drop point with a big sweeping belly, that tapers upwards towards the tip. The shape reminds me of the profile of a boat. The integrated cap lifter / wave feature is another novel aspect of the blade and a signature RYP design element. I’ll discuss the functional aspects of that further in the “deployment” section of the review. The blade is ground from over 4mm thick stock. It’s substantial for a small folder like this, but the high flat grind gives the knife decent slicing performance. I found the Urban to be very capable with cardboard working through several thick cardboard boxes that I encountered in my latest round of work with my rental property. The blade was extremely keen out of the box, and edge retention was excellent. The thick stock and partial flat grind means it won’t slice an apple like a traditional folder, but the knife will get the job done, and there are plenty of practical touches. The stonewashed finish on the blade hides wear and matches the hardware. There is a sharpening choil. And the edge has been evenly applied, a detail I always consider, as it can be a good indicator of quality control. In 2015 the Urban was originally offered in S30V blade steel. These days the Urban has been upgraded to S35VN. I’ve reviewed dozens of knives in S35VN at this point. Although it may not be the most exotic choice of blade steel, S35VN is excellent stuff and was a good choice for the Urban. This is a proven steel that holds a good edge, sharpens easily, exhibits high corrosion resistance, and is reasonably tough which means it will not chip out easily. S35VN is a great all round high performance blade steel. I find that if you don’t completely dull the knife, then all you need to do to maintain a hair shaving edge is run the knife along the fine stones of the Spyderco Sharpmaker. Those fine stones are all you need to keep a razor edge on this knife. The handle of the Urban is comprised of two thick titanium slabs and a black hard anodized partial aluminum backspacer. The handle has been beautifully executed. Fit and finish is top notch. The titanium handle slabs have been chamferred and left with a bead blasted finish. The silver hardware and all the pieces are perfectly flush. There is a decorative oversize pivot. Everything exudes a level of quality that you would expect from a knife at this price point. The Urban is a small knife, but the spare design gives you plenty of room for a full 4 finger grip, and the thick build fills the hand. I found the Urban to be both a comfortable and capable work knife. My only gripe with the ergonomics relates to the “wire stripping jimping”. Specifically, the biggest jimp farthest away from the tip of the blade. I find that to be too grabby for my tastes and would prefer either a smaller jimp, or more traditional toothed jimping. I levied this same criticism against the original HEST/F. While I understand that the Urban is designed to have a few multi-tool features integrated into the design, I’m still not sold on the wire stripping jimping. The Urban features a reversible tip up deep carry pocket clip. The clip has excellent spring strength, and it buries the knife into your pocket. While the knife is relatively thick and over 4 ounces, I don’t notice it during carry thanks to the small footprint and the excellent clip. The knife stays in place and out of the way until you need it. That is exactly how I like my folding knives to carry. The Urban is interesting because it is a bearing equipped folder with thumb studs or a wave opener. As a lefty I find the thumb studs to be a little tight as there is not as much room to access the stud on the locking side of the knife, but there is plenty of room on the right side and once you get placement on the thumb stud the blade almost explodes open thanks to the strong detent and bearings. The bottle opener on the blade doubles as a wave opener. It’s an easy knife to wave off your pocket. Additionally you can use this as another spot to flick the blade open in addition to the thumb studs. The bearings are smooth to the point where you can easily shake the blade closed. For lock up DPx Gear went with a titanium framelock reinforced with a steel lock bar insert. The steel insert doubles as an over-travel stop, but it also fixes the sticky lock issue that plagued the original HEST/F. Lockup is early. Around 40% of the lock face engages with the blade. Lockup is also secure. There is not a shadow of blade play in this knife. It’s rock solid. I think DPx Gear nailed the lockup and deployment section. The knife rivals any Zero Tolerance folder I’ve handled. I think ZT is a good benchmark as their knives are consistently good. I think at some point DPx will need to use this OEM to build them a flipper of some sort. Hands down this is the best DPx Gear folder I’ve handled to date. I think they took all the lessons learned from their prior designs and built on those lessons to develop the Urban. I also think that the choice to work with a US based manufacturer is a good one. I like Lionsteel knives, but was never a big fan of the original HEST/F and the way it was built or the rotolock. This Urban is simply a better knife with its bearings and stainless steel lockbar insert. The rest of the knife has been beautifully built. The parts line up perfectly. The machining is crisp and clean. The finish work is superb. For constructive criticism my biggest gripe is probably that one section of wire stripper jimping. It’s a little too sharp and toothy for me. But in practice I didn’t find that to be a deal breaker as I didn’t notice the jimping much when I actually cut things. Beyond that I don’t think I would change anything on this knife. If you are a fan of sturdy little full titanium knives, knives like the Spyderco Techno, then I think you are going to enjoy this one. It’s nicely built, performs admirably, and is entirely unique. It’s not inexpensive, and the full titanium version here will set you back about as much as a Small Sebenza, but I think the quality is comparable. 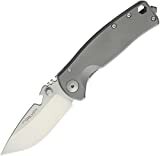 Additionally, DPx Gear offers a version of the Urban with a G10 scale that is around $200 and weighs about 3.6 ounces. At that price and with a near 1 ounce weight reduction, I think that is a highly competitive offering. I recommend purchasing the DPx Gear Urban at Amazon or BladeHQ. Please consider that buying anything through any of the links on this website helps support BladeReviews.com, and keeps the site going. As always, any and all support is greatly appreciated. Thank you very much. This is a very interesting option, Dan. Thanks for the great review.